Category – Sales and Offers. On this page you can find detailed information on our current offers or sales that you can find throughout our site. These go VERY quickly. Please let us know at point of order what you would like with your cabin. These change daily and we do try to update this page as they change. Further information on roof shingles and the market: Roof Shingles for Log Cabins. We will try though to accommodate your choice but don’t shout at us if a certain style or colour has gone please. If the colour and style is important to you please consider ordering the ones you require, we’re the cheapest available for IKO shingles anywhere so regardless of the free offer ones or bought you won’t find a better deal with any other supplier. 97% of the time we can meet your preference except when stocks are very low. Although there is a bitumen strip on the tiles and that they should also be nailed in at least three places on a strip we are recommending (due to our dodgy weather recently) that you consider also applying Felt Shingle Glue along the leading edge when sited in exposed areas. This is also necessary with low pitched roofs. IKO are now recommending a membrane under layer is also applied. As a company we do not think this is necessary on garden buildings and nor does other garden building companies. However if you wish for a underlay membrane please see of roofing felt page for standard felt or IKO recommended membrane. If you are using a membrane we would recommend the standard felt over the IKO membrane but the choice is yours. Please note for lower pitched roofs and flat roof a membrane is recommended by us as is shingles glue. When shingles are free and available they can be selected from this drop down menu on the product page. If we do not have the free ones you require or they are not available please order them from here. 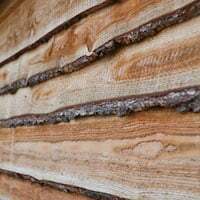 Do you need Roof shingles on your Log Cabin? Do you need FREE ones? In my opinion the answer is always yes! 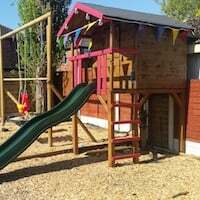 When I was first involved within this industry about fifteen years ago log cabins also emerged as a popular alternative to the humble shed or summerhouse. Back then it was unthinkable to sell them without shingles. As well as the style of the buildings the shingles set them far apart from a common shed which of course a log cabin is not. Then, about five years ago some bright spark realised that if they sold the cabin with felt they could undercut everyone else making them look the best value for money. So, now you will find everyone sells cabins with felt as everyone had to follow as customers look immediately at the head line price when zipping through the internet or a brochure. Roof shingles then became an option across all retailers, which is a real shame as I think all Log Cabins need roof shingles to become anything other than a crappy shed. You’re buying a building that will last forever if cared for, surely you want a roof material that will do the same? Shed felt roof – Horrible isn’t it! This is what is supplied as standard with all log cabins these days. It’s ordinary shed felt and as such it doesn’t look nice at all. Try applying this to a pyramid roof or a roof over 3m in length, it’s horrible and impossible to make it look nice, more than likely you’ll end up ripping it as well, you’ll see the roofing nails and anything more than about 3m you’ll end up with ripples and bubbles in it. It looks so much better, it turns a ‘Shed’ in to a proper garden building. It also lasts for years, no nails can be seen, no ripples and no rips and of course you won’t have to do it again in a couple of years time. An old log cabin shingled roof covered in moss, algae and bird droppings. This building is very old now as you can see but the tiles are still going strong. An ordinary felt roof would need replacing after about two – three years, less if it had trees over it like my old log cabin. Within our catalogue and drop down lists on all the cabins we have shingles that can be selected in a variety of colours, most of which can be available in straight, hexagonal or curved style. you can also see our roofing materials in the category: Roofing for Log Cabins. These are all manufactured by a company called IKO who enjoy world renowned success and unrivalled quality, you really can’t get better than these, if you watch the movies you’ll see them on all the American houses as they love their felt shingles. I’ve hated the fact that we sell buildings with ordinary felt, in fact a colleague tells me “she shudders” when a customer buys a log cabin without them, to tell you the truth I do as well as felt really does spoil what should be a stunning building. It also saddens me when a customer calls up and asks for shingles saying: “they should have ordered them with the building“, which, they should have and we try to encourage them to but some customers think we’re trying to up-sell and refuse at the time of order. It’s then upsetting for them and us when we can’t offer them at the price on the web page as those prices are calculated taking the standard felt away and no delivery charges as they are priced to go with the cabin. When we then have to charge them higher prices due to delivery and no removal of the felt costs they get a bit miffed and disappointed. Normal prices of felt shingles can be seen in the roofing category. It’s not good for either of us to be disappointed so please think about shingles with your order, we’re not up-selling we’re making an honest recommendation. Now the good bit …..
I’m going to go back to the old days of log cabins and offer FREE shingles with all our log cabins AND the prices of the buildings aren’t going to go up either unless the Euro exchange rate forces us to or a promotion ends. The point is our FREE offer shingles aren’t going to impact on the prices. Tuin is pretty big and we have come up with a solution so we don’t have to send you the dreaded standard roofing felt. All our old stock, last years colours, shingles in damaged packaging etc are all sitting around and aren’t sell-able as a brand new product. Normally we will sell these in bulk to shed manufacturing companies when they ask for them. Instead of selling these to the trade we’re going to keep them and are now offering them FREE with all our log cabins and shed manufacturers are going to be a little peeved with us. So, we’re going to give you the Offer shingles FREE on all the log cabins but the catch is we get to choose what style (straight, curved or Hexagonal) and what colour we send to you without charging you for them. This is because we don’t know what we have / will have of the offer shingles at any one time until we allocate them to an order. I hope you don’t mind? There’s got to be a trade off and you’re getting the shingles for free. Of course after placing an order we will email you the colour we are sending and if you don’t like it you can opt for the standard roofing felt. Alternatively you can choose a colour and style of your choice from this season ranges using the drop down menu on each of the log cabin product pages so you know exactly what you’re getting. You’ll find all our shingle prices better than any competitor anyway! I don’t know of any supplier / manufacturer / retailer who can even get close to this offer. Have you found anyone who can offer shingles at our prices, even the standard ones? Let alone FREE shingles! OK, after a search I did find one supplier but the price of the cabins are far too expensive to worry us about. Well, we’re almost back to the old days. At least now we can sell cabins with shingles again and still be the most highly competitive supplier there is in the UK. Please understand though we may not be able to keep this up all the time so we do reserve the right to stop the offer when stocks are depleted and this will generally be without much notice at all so please don’t shout at us if you suddenly see the offer has been withdrawn on the log cabin you have been thinking about for a little while. Before you ask, we’re really sorry but when it ends it ends and we can’t offer them retrospectively. This is much like all our offers. We are honest and always will be if it’s offered please take it. When it’s gone it’s gone. Felt shingles roof on our Asmund log cabin. The proper way a log cabin should look. It always amazes me how quiet everything suddenly goes in this industry once the leaves start dropping and Autumn is here, it gets worse when the clocks go back. For me it’s time to put my feet up a bit, grab a quick holiday and some time with the family. I do think though us humans are funny creatures, as soon as it gets a bit murky we’re not interested in anything outside, especially the garden. But, as soon as it gets light and sunny again we’re away. You might be interested in this graph of how busy we have been. The graph shows our busiest period over a 12 months. This is the same for every company I’ve been involved within the garden industry. Sales start in January as people look forward to the Spring. Then it builds to the crescendo of March and April. Then drops steadily down until the summer holidays. Then some renewed interest as the weather stays nice. Then, strangely September and October we sell a lot of bigger buildings. In a previous job we’d sell a lot of garages. Then comes the clock change, the weather gets rubbish and bam, that’s that for a few months and I get to relax and chip off somewhere hot. But we still have a nice trickle through of customers and these are perhaps the clever, canny customers. They waited and are planning for the Spring next year, perhaps they know how the garden industry works? Simply put, if you want anything major for your garden late Autumn and early Winter is the time to buy as the prices will be the lowest possible! I found an interesting article on a recent search which was as a result of a survey on the best time of year to buy various items from computers to gym membership. Strangely they didn’t survey the garden industry which is a shame as it’s worth just over £5 Billion a year in the UK, we do love our gardens! If they had surveyed the garden sector they would have found that the best time to buy for your garden is November, December and January. Perhaps you wouldn’t buy a fence or a planter, or even garden furniture. But these months are the time to buy a major expense such as a shed, summerhouse or log cabin. Retailers will be wanting to remove stock to make way for the new season. Timber price and product prices will start to rise the middle of January early February. Hauliers will be re-negotiating costs which will trigger late January early February. Retailers will need to maintain a cash flow. The very best service is often given in the quiet months as staff are a lot less busy and can often give you far more attention. Prices will be at their lowest to maintain and encourage sales, lots of deals will be on offer. We’re the same as everyone else, we drop a lot of our prices for Log Cabins, Gazebos, Verandas etc to try to keep the sales coming. We have some crazy, crazy bargains during those three months. We practically make nothing on the products but it keeps things moving. Of course some customers will want to wait until the weather is better, until it’s warmer. Granted laying a base can take longer when it’s wetter and churn up your garden a bit but if you can manage it and get your log cabin up it will be worth it plus you’ll be ready for next spring and saved a ton of cash! I always tell customers that the only thing that is affected by rubbish weather is the fitter and never the building! As we are preparing our 2018 catalogue, unfortunately we’re going to have to let go a few of our Log Cabins. So as a parting gift to some of our well known cabins, we are offering discounts! See below for which cabins these include, this page will be updated as more offers come in, while stocks last! In addition to these, we have recently added more offers around the site! Even with Log Cabins that will be staying in next years catalogue. You can start by looking in our Log Cabin page- these offers are available until the end of the year! Featuring a contemporary flat roof, storage shed and large open side shelter supported by two posts. With flat roof, the 40mm Giga Modern Log Cabin is designed to imitate the wide, horizontal lines of the natural landscape. Perfect for adding a contemporary feel to any garden, this log cabin combines a storage shed and side shelter into one practical building. The Gigamodern Log Cabin– Now available for £2,358! 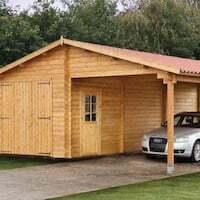 Flat roof Super Modern Log Cabin measuring 4.2 x 4.2m. With centrally positioned double doors flanked by two bottom-hung sash windows. The Supermodern Log Cabin is a contemporary style Cabin with a sleek flat roof, centrally positioned double doors and high positioned windows. Made from 40mm Spruce timber, the supermodern is a stunning design that offers all year round use! The Supermodern Log Cabin– Now available for £2185.50! The Lisette Garden Office Studio. 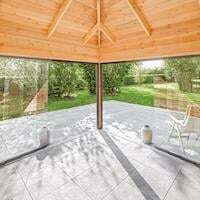 The Lisette garden office studio measures 6.09 x 3.64m and features double glazing and double skin 19mm clad walls. 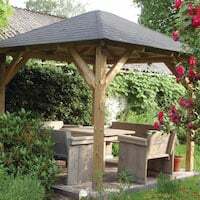 The Lisette is split into two, one side an enclosed office and the other open as a gazebo, this layout is perfect for a multifunctional garden building. Making this Log Cabin perfect to be used as: a summerhouse, garden office, art/music studio and more! The Lisette Log Cabin– Now available for £3,819.85! A contemporary flat roof model in 19mm cladding, the Kaisja studio features a double door and two fixed windows. Dimensions are 2.72 x 2.01m. This Modern Studio may be smaller in size, but doesn’t stop you from having crisp, clean lines from the Spruce Cladding. With the two fixed windows being adaptable for either side of the Cabin, this is a perfect Log Cabin for art/music studios. The Kajsa Modern Studio– Now available for £1,268.90! 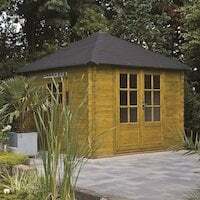 A unique combination, the Morten features both a gazebo and shed annexe in one garden building. Measuring 3.5 x 5.0m and manufactured using 28m tongue and groove logs. Who needs a separate Gazebo and Storage Shed when you have them both with the Morten? Inspired by the log cabin summerhouse and shed combinations, a full height partition creates a distinction between the two functions. 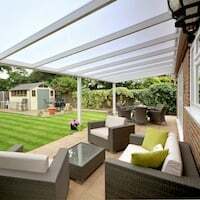 It also offers flexibility with the Gazebo being able to be installed on either side of the Shed. The Morten Log Cabin– Now available for £2,112.23! The Amstelveen Modern Log Cabin. The Amstelveen 28mm Log Cabin measures overall at 5.82m x 2.48m- Including the incorporated canopy area. A cabin that screams modern, the Amstelveen Log Cabin features a three measure length gazebo, with a 2.8m x 2.48m Cabin ideal for storage use or as a main summerhouse. 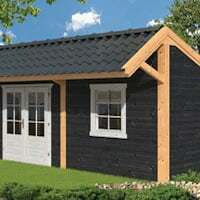 The Amstelveen offers all the functionality and versatility of a conventional garden shed. Yet instead of panels, this building is constructed using interlocking 28mm Swedish pine logs. 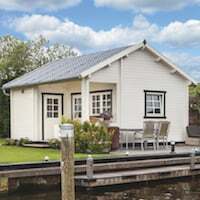 The Amstelveen Modern Log Cabin– Now available for £1,410.19! Keep an eye on this page or follow our social media pages to be notified when this list has been updated! Occasionally here at Tuin we do tend to save up our old stock in our warehouses. Whether they are old stock, weather damaged items or customer returns/cancellations in order to add them to our Rummage Sale page. All of our Tuin garden products listed on the Rummage Sale page will include details of the condition that they are in. 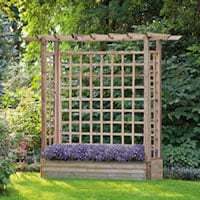 These may not be ideal for everyone, but for those who want to save a little or were planning to decorate their garden product with a coat of paint or two- it may be worth to have a look! Customer Image of a Beautifully Decorated Ingrid Log Cabin! All of the garden products on this page are in limited quantities- so make sure to check them out before everything goes! Some of our best selling Timber Log Cabins. More products will be added to this page when required, so make sure to keep an eye out for more update posts like these. 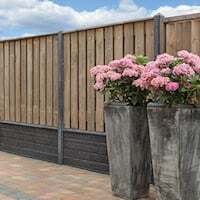 You can find out more of Tuin’s Special Offers and Deals here. 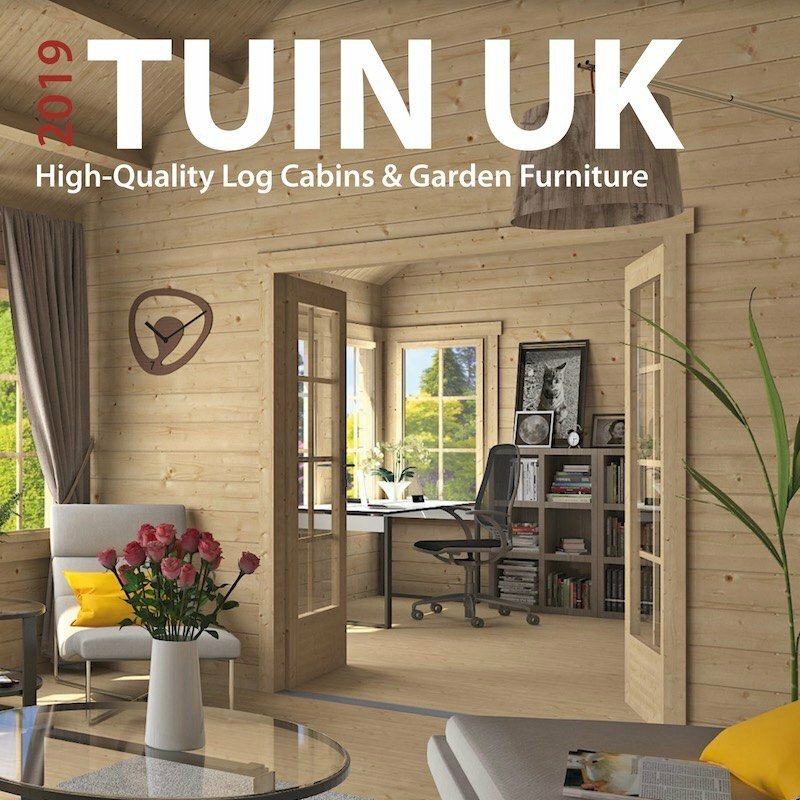 You can find out more about our website and other news from Tuin here. We’ve been looking at this for a while. We get asked a lot of times for windows in the roof or can you fit something like a Velux window in the roof of your Log Cabin. The answer is yes you can. But to fit a velux requires a lot of modification, a lot of strengthening and a bit of mucking about. They can be fitted but it’s not a fun job. This is a cracking new product we have added, it seems to tick all the boxes, it’s easy to fit, light enough to not worry about extra strength and provides a good lot of light into your log cabin. Showing the before and after, it’s quite a difference. You can see there is a huge difference. The skylight is easy to fit on a fresh install but you do need to base it around a felt backing, the surface that the oil based compression gasket seals onto needs to be relatively smooth, standard shed felt or EPDM or Easy roof membrane is ideal. If you have a shingle roof you will need to have an area of felt only. Using felt shingles but you will need an area of Felt or Easy roof membrane to help it to seal. Installation of the skylight / roof vent is very straightforward and you do not even need to be on the roof. Installation as a retrofit is a little trickier and I will be doing this over the next week or so and posting on this on the way I think it is best done. As well as a normal roof you can also install this on an insulated roof, it may though be necessary to add additional trim around the rim of the unit. Installed with an insulated roof. Longer bolts may need to be sourced locally and also trim for the inside. We have two new products for this year as alternative roofing systems for your log cabin or larch building. The Easy Roof Membrane has been extensively tested in Germany and the Reed thatching panels in Holland for several years. But, I have not used either of them and as I have mentioned before I feel slightly uncomfortable recommending a product I am not certain on despite assurance they are top of the range, highly successful in Europe and tested thoroughly. Unfortunately I do not install much these days so I am asking for customer’s help. UPDATE 4.3.16 Mrs Wall of Penzance has taken the Thatched Roof Offer. UPDATE 9.3.16 Mr Kelman of Aberdeen has taken the Easy Roof Membrane Offer. So, I have an offer for you …. A very limited one and limited to the first person to take me up on it. So, on your marks …. This offer will not last very long at all as someone will be quick off the mark. 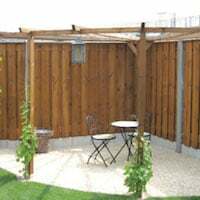 If you are considering a flat roof log cabin from our Modern Log Cabin range such as perhaps the Elburg Log Cabin then I would like to offer you the Easy Roof Membrane for FREE. Easy Roof Membrane is a highly viable alternative to EPDM and of course the highly inferior roofing felt that needs replacing every few years. I’m particularly excited about the reed Thatch Roofing Panels. They’re an amazing product and looks stunning. I have played with thatching before in the UK in the traditional way but not this system. I have seen this in Holland but have never used it. It does look stunning and very impressive in the flesh though. UPDATE 4.3.16 Mrs Wall of Penzance has taken the Thatched Roof Offer and it is now closed. So, if you are looking for a apex roof log cabin such as the Skov log cabin or maybe the Perlund log cabin then I’d like to hear from you. I’d like to offer you a Thatched Roof for FREE. An honest written appraisal of the roofing product from your point of view. A series of photographs of the installation. I’ll even send you a FREE action camera to video it if you would like, you can of course keep it afterwards. A written assessment of your thoughts on it including our service and help. A follow up in six – twelve months on your thoughts and living with the product. Your assessment on the longevity of the product. This will help me and other customers greatly and give an unbiased view of these new products. I’m excited by both of them but I have no experience of installing them. I hope someone can help me out? Ideally you will be within 100 miles of our UK base at NR15 1HJ so I can pop out and have a look at the final install with your agreement. UPDATE 23.2.16 Mr Munn of Aylesbury has taken the Metal Roof tiles Offer – The offer for Metal Roof tiles is now closed. Metal roof sheets being offer FREE OFFER TAKEN by Mr MUNN. You can email using our contact page for any of these offers but please title it with ‘Roof Offer – Richard’ so it will be labelled for my attention, please only email your interest in this offer as I’m rarely in the office these days seeing customers or helping with service but I will always see emails, even on my days off. Please only take me up on the offer if you are prepared to return the above asked for otherwise you might find an invoice hitting your inbox in a few months. These are three viable alternative to Roof Shingles, Roofing Felt and EPDM and can add a new dimension to either the longevity of the building or the whole look and feel of it.